Carnoustie’s storied reputation is among the most well-known in all of golf, as it is considered by many to be the most difficult golf course in the world. However, do not let this fearsome legend put you off, Carnoustie remains a truly spectacular layout, one that should be on the bucket list of every golfer. As you walk down Carnoustie’s rolling fairways, you can feel the history of the course, where golfing legends have been forged for decades. Having hosted 8 Open Championships, Carnoustie has remained one of the top-ranked courses in the world, made even more famous as the site of Francesco Molinari’s epic Open win in 2018. Those playing the Championship course at Carnoustie are in for a memorable round of golf. The course has a reputation as being one of the toughest in the world and whilst this is certainly true from the championship markers, from the yellow tees of the day the course is a manageable 6692 yards at a par of 70 (holes 12 and 14 are par-4's off the yellows rather than 5's off the whites). You'll be left enjoying landmarks such as Hogan's Alley on the superb par-5 6th hole, Nicklaus' bunker on the par-4 9th and Miller's bunker on the right of the 18th fairway where he took 2 to escape which enabled Tom Watson to claim the Open in 1975. The closing 5 holes are without doubt some of the finest in golf. The 14th, a par-5 measuring just shy of 500 yards, Spectacles requires an accurate drive up the right hand side of the fairway avoiding bunkers lining the left, while a blind approach over the famed Spectacles bunkers will hopefully leave you with eagle or birdie attempt. The 15th is a display of golf course design at its finest. With bunkers lining the raised fairway on the right, combined with a drop off on the left hand side it is imperative that you find the fairway off the tee. If you keep it too close to the left hand side of the fairway you'll be met with a tricky approach with the ball below your feet which will encourage your shot into the bunker located short and right of the green. The par-3 16th looks an easy prospect from the tee, it is however protected by both length and undulations which will catch any shot pitching short of the putting surface meaning anyone scoring a par on this hole is sure to pick up a shot on their playing partners. It is not just the tee shot which is key to playing the 17th, with the Barry Burn meandering along and through the fairway finding the short grass is a very difficult prospect, keeping it left off the tee will give an easy route to the green but brings more of the Burn into play and will leave you with a longer approach. Take aim at the Clock on the hotel on 18 and just hope that you've given yourself a chance to pitch it onto the green in 2 for any shot falling short will find itself in the Barry Burn, and after all no one likes to end their golf holiday like Jean Van de Velde do they! The Championship is one of the most feared tournament courses in the world; 1999 Open winner Paul Lawrie emerged victorious from what was effectively a war of attrition, after Jean Van de Velde's hopes drowned in the Barry Burn. For many Lawrie's win will be Carnoustie's most famous due to his sensational closing round of 67 and Van de Velde's triple bogey 7 on the 18th hole to force a 3-way playoff between Lawrie, Van de Velde and Justin Leonard. Lawrie's closing birdies on 17 and 18 to win the playoff and claim the trophy should've been the lasting memories of the 1999 Open but the sight of Van de Velde in the Barry Burn with his shoes and socks off are the enduring images here. The course was lengthened for the 2007 tournament to add to the already abundant history, which includes Ben Hogan's famous performance in 1953. 2007 was a slightly less dramatic affair with Padraig Harrington and Sergio Garcia being left tied on 277 after 72 holes. Both had chances to win in regulation play with Harrington finding the Barry Burn twice on 18 before scrambling to save a double-bogey 6 while Garcia was left ruing a missed par putt on 18 which would've seen him claim his maiden Major. The 4 hole playoff on holes 1, 16, 17 and 18 was won by Harrington following 1 birdie, 2 pars and 1 bogey, Garcia's 1 bogey and 3 pars left him one-shot shy and Harrington claimed the Claret Jug which he would successfully defend at Royal Birkdale the following year. 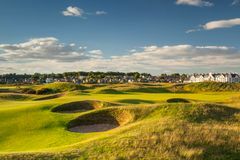 The Burnside Course is the second of the 3 courses at Carnoustie Golf Links and is often overshadowed by the world renowned Championship Course. Despite this the course still carries a great deal of history and many of the game's greatest players have graced the stunning fairways. One of the most famous moments to occur in the Burnside Course was in 1953 where Ben Hogan famous shot 70 in order to qualify the Open that year, which he went on to win. All of the holes are full of character with the 5th and the 14th being amongst some of the best in the world as their dramatic nature demands the best out even the lowest handicappers in order to make par. The third course at Carnoustie Links is the Buddon Course which is the newest of the three having been originally designed in 1979. The course has recently just finished a $1 million refurbishment which has revitalised the course and has truly made it one of Scotland's less well known gems. As a result of the redesign the course has become a much tougher prospect creating a challenge for golfer's of all abilities with the three different tee boxes making all the holes accessible regardless of handicap. Great course, we played in March and some of the tees were a bit forward and it played short but great trip nonetheless. Another quality course with slightly wider fairways. From the clubhouse staff to the starters a massive thank you to you all, you made our trip unforgettable. What can I say but absolutely class. Our group loved everything about this course and the wind made it just how we would expect it to be on a true links course. We where rained off on our first day but we were told that we could play it again the following day after another round if we wished. Staff couldn’t do enough to help. Enjoyed a great round at Carnoustie and would recommend anyone come and play this superb Open venue. We were greeted with a warm welcome by Nicky and Colin in the professional shop and set about taking on the very fair Championship course at Carnoustie. The course obviously has a fearsome reputation as Carnasty but we found it very playable off the tees of the day, whilst I have no doubt it is very much harder off the whites, we're not professionals! Some great holes all around the course with a particular favourite of mine the 14th which is called Spectacles for its large bunkers which protect the green. Walking up 18 you can't help but wonder how Jean Van de Velde did what he did but my less than conventional 4 was a great way to finish a very memorable golf course.